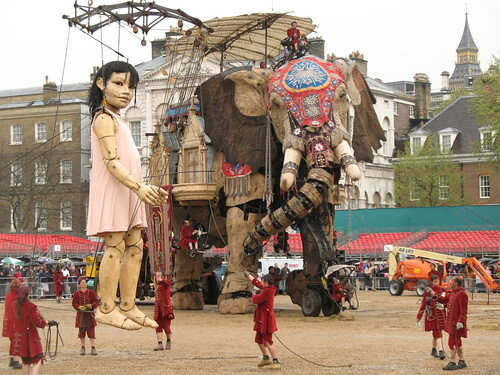 This past weekend, Your Humble Narrator went to see The Sultan's Elephant, a series of fantastic street-theatre pieces put on by French street theatre group Royal De Luxe and involving enormous puppets on industrial cranes, teams of Liliputian puppeteers in red livery and a 40-foot robot elephant. Photos are here. I took photos on two occasions: once using a digital SLR and once using my small compact camera (a Canon PowerShot A620). Oddly enough, more of the ones with the compact came out well, because, being behind a large crowd meant that the only way I could get a good shot was to hold the camera up over my head, and doing that, aiming is a lot easier with a fold-out LCD screen than using a SLR. It's occasions like this that made me wish that someone would make a hybrid digital camera, which takes standard SLR lenses (like, say, the Canon EF ones) but is not a SLR, instead having a foldout screen like the PowerShot G series. This would give most of the advantages of a SLR, whilst making it possible to aim without having one's eye to the eyepiece.